Credit Cards Being Paid Off? BlackRock: 4 Calculations Per Minute! I have not. I track every penny I spend and have been doing so since 2000. I'm just not seeing the inflation that Shadowstats claims. 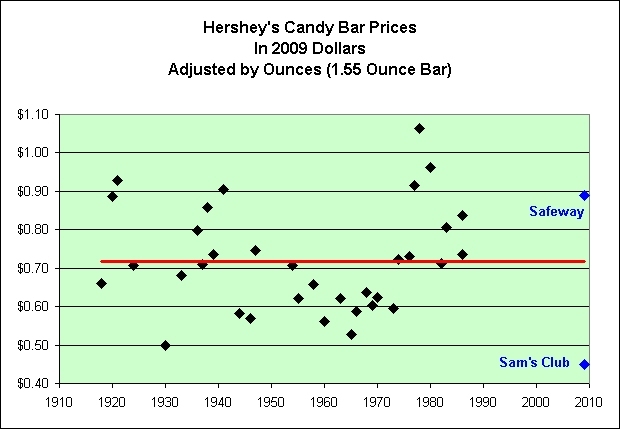 Let's try a simple test using the historical price of Hershey's candy bars. If the CPI was vastly under-reporting inflation over the years, then surely the price of candy bars must be rising at a rate far higher than the government will admit. 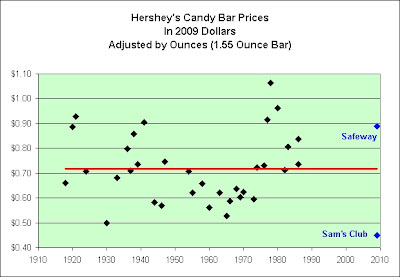 Therefore, all we have to do is look at the long-term trend in inflation adjusted candy bar prices. I should also point out that Sugar #11 has been in a bull market. If inflation was going to strike anywhere, surely sugar-packed candy bars would be among the first to feel the inflationary pain. Therefore, it is probably not fair to judge the BLS on candy bar prices alone. Let's try anyway though. The long-term trend is flat. The CPI has clearly been tracking the long-term price of candy bars fairly well. The two data points I offer from 2009 are well within the margin of error. You will note that inflation adjusted terms, the most recent Safeway data point is very similar to the pricing of candy bars seen in the 1970s (the last time energy prices were high). I do not see any signs of a CPI conspiracy based on the price of candy bars. I'd really like to know too. Perhaps people just love a good conspiracy theory. Here's a favorite of mine. Esoteric Hitlerists and conspiracy theorists interested in Nazi mysticism and World War II have speculated that the Germans landed on the Moon as early as 1942. According to other theories it is believed that the Nazis had made contact with 'half a dozen' alien races, including the malevolent Reptilians. Oil at $83? Earning 1% Interest? Things Not to Hoard! One consumer put it best on Savingadvice.com: "If I go to my local store and but 2 candy bars for $1 a piece, I spend $2 and they will last a week. I buy a box at Costco of 24 candy bars for $12, they still will be gone in a week. Even though the unit price is less, I end up spending more." We buy candy bars in bulk to save money. Believe it or not, we do not actually eat 12 times more candy bars per week just because they are in the house. I know it is hard to believe, but it is true. We apparently have some self-control. I should also mention that it does not actually cause you to spend more money on food. You can easily spend just $4 per day on food if candy bars are all that you eat. A Snickers Bar has 280 calories of food in it. That said, you should probably plan on getting scurvy at some point though. It may sound like a good idea at first. Paper towels are not perishable and they do tend to cost less when you buy them in bulk. They do tend to cost less when bought in bulk and they are not perishable. Don't stock up on them though, especially with oil sitting at $83 per barrel. Keep the money in your savings account earning 1% interest instead. Just like with paper towels, you don't want to go overboard purchasing toilet paper. Good grief. It must be a slow news day. It's a great day for sarcasm though. The gray areas represent recessions. As seen in the chart, oil has gone up faster than the S&P 500 this decade. Oil has also gone up faster than the S&P 500 during this economic recovery. Should this new long-term trend continue, I would expect more pain than pleasure. 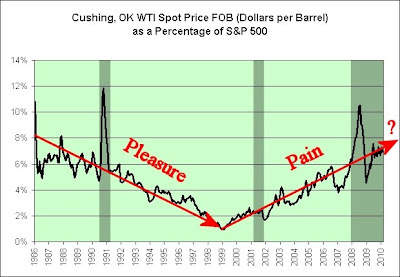 Note that the trend can continue even if oil's price does not rise. Stocks falling in price would be sufficient. As I emphasized last week, even if we had no concern at all about a second wave of credit strains, we would still be fully hedged here based on the present combination of rich valuations, overbought conditions, overbullish sentiment, and hostile yield pressures. Presently, we are also at the peak of concern about the potential for fresh credit difficulties to emerge, as we move into the first portion of the Alt-A / Option ARM reset schedule. Is this as good as it gets? For the time being at least, it seems to be. The new law says that health plans and insurers offering individual or group coverage “may not impose any pre-existing condition exclusion with respect to such plan or coverage” for children under 19, starting in “plan years” that begin on or after Sept. 23, 2010. But, insurers say, until 2014, the law does not require them to write insurance at all for the child or the family. In the language of insurance, the law does not include a “guaranteed issue” requirement before then. Consumer advocates worry that instead of refusing to cover treatment for a specific pre-existing condition, an insurer might simply deny coverage for the child or the family. Leeroy's actions have caused the larger World of Warcraft community to use his name to represent any action that could be seen as potentially dangerous and/or incredibly stupid. The Leeroy movie is generally suggested to be a must-see for any and all WoW players. It has become a popular term for a person who causes a bad pull that causes a group wipe. Immediately following the bankruptcy filing, an already distressed financial market began a period of extreme volatility, during which the Dow experienced its largest one day point loss, largest intra-day range (more than 1,000 points) and largest daily point gain. What followed was what many have called the “perfect storm” of economic distress factors and eventually a $700bn bailout package (Troubled Asset Relief Program) prepared by Henry Paulson, Secretary of the Treasury, and approved by Congress. He was especially surprised at the large percentage of people who think their tax rate will decline when they retire. Um, probably because they no longer have a job bringing in steady income? Hello? Anyone in there? Many investment sites have Roth conversion calculators. The results are only as good as the assumptions you use. I ran some scenarios on this Morningstar calculator, using conservative assumptions. 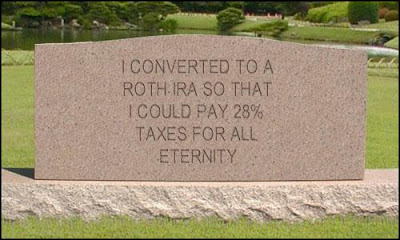 I used a $100,000 IRA balance for conversion and assumed that none of this balance had been funded with post-tax money. I also assumed annual returns of 5 percent now and in retirement (many calculators use higher returns as a default),and said that I would retire at the age of 70 and that my retirement would last 20 years. Tax rates are important, too. I used a current income tax rate of 28 percent and a 15 percent rate for long-term capital gains. Again, to be conservative, I said my tax rate at retirement would rise to 33 percent. At age 60 in 2010, converting to a Roth would cost $28,000 in 2010 taxes and provide post-tax income of $13,070 a year in retirement, compared with $11,681 for a traditional IRA. A 33% tax rate at retirement with a post-tax income of just $13,070 a year? You have got to be joking! To put this in perspective, I earned $33,915 in 2009 (deflation hit my inflation protected treasuries). I owed $1,994 in taxes. My post-tax income was therefore $31,921 and my retirement tax rate was therefore 6%. That is a far lower tax rate than when I was working. So why would I have wanted to prepay taxes at 28% when I was ultimately taxed at just 6%? Now try to imagine what my tax rate at retirement would be if I had a post-tax income of just $13,070 instead of $31,921. Hint: The 2009 Federal Poverty level is $10,830. In his defense, he did say that "the results are only as good as the assumptions you use" though. Unfortunately, if you start off ASSUMING that your tax rate will be higher in retirement than it was when you were being paid to work then it isn't all that hard to show that a Roth IRA is good for you. Garbage in, garbage out! In February, I joked that the stock market might be using cartoon physics to propel itself higher. Here is the chart that I offered. Damn it! It seems I forgot to factor in "hot air" friction! The trajectory is clearly coming up a bit short of the original estimate. Once again, please don't read too much into this. Almost anything can happen in a world filled with cartoon stimulus and/or cartoon physics. I'm certainly not going to short the stock market based on these silly charts. I'm more than happy just watching from the sidelines. 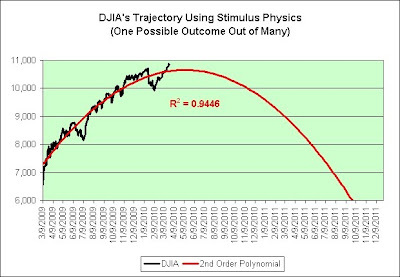 The vast majority of the time the stock market does not use or need cartoon physics to function properly. It might be different this time though. Who knows? Further, it would be preposterous to argue that the stock market could ever come down. Everyone knows that it only goes up, again. Speaking of cartoon physics, is Capital One Financial possibly rolling over again or is it just me? I was never given the gift of technical analysis. I can never see into the future. It might seem like it at times, but that's probably just my gut talking. It is currently ready to rumble. NEW YORK (Reuters) - What's the value of a pint of beer? Let the market decide, says a new restaurant in Manhattan where prices for food and beverages will fluctuate like stock prices in increments according to demand. Note that this system will work great during severe deflation, stagflation, and severe hyperinflation. Owners Levent Cakar and Damon Bae admit the stock exchange theme is a gimmick but hope a good deal on drinks and their hamburger's tastiness will win over customers. It is a very amusing gimmick. New York has about 23,000 restaurants, with about 4,400 opening each year according to the city's Department of Health, which tracks establishment licenses. If 4,400 open each year but there are only 23,000 total, you can pretty much do the math to see how hard it is to open a successful restaurant. Here's some help with the math. It would only take 5.2 years for 23,000 restaurants to be created at a 4,400 per year pace. New York became a state 222 years ago though. The restaurant opens April 1. They are opening it on April Fool's Day. They might succeed. It tells me that they at least have a sense of humor. If they do succeed I suspect that a restaurant currently near them might no longer succeed, especially in this economy. Behold the power of capitalism. The Perfect $46,000 Budget: Learning to Live in California for Under $50,000. Wow! That's 67% of the budget. How does he do it? Hmmm. That's only 1% of the budget. As seen in the comments, he's got a reason for spending so little money on health care though. In regards to health insurance, you can see why so many people go without coverage. Keep in mind that this is the median income. There are people living on $25,000 a year. Coverage for a healthy couple can go for $250 to $300 so there is money in the budget for this. They would have to chop back a bit on the emergency fund or the Roth IRA. They might even need to spend less than $1,800 on rent, food, entertainment, and vacations. Just a thought. Either way, the overall arching point is you can live on $46,000 a year in California with no debt. I keep hearing people that make $75,000 a year say it is impossible to live in California with no debt. Well, here is the proof. All the other nuisances are simply personal quality of life items (i.e., new car, McMansion, or iPhones). If he's in a car accident and it is his fault (50% chance say), then he might not have a working car. He doesn't have collision insurance. If his apartment complex burns down, then he will most likely lose all his personal possessions. He doesn't have renters insurance. That's nothing compared to his lack of medical insurance though. He is one major medical expense away from taking on a serious amount of debt. I'm 45. I've been in the hospital about once per decade. I'm about average. The average charge for a hospital stay is over $11,000 and the average hospital stay is about 5 days long. Illness and medical bills caused half of the 1,458,000 personal bankruptcies in 2001, according to a study published by the journal Health Affairs. In percentage terms, TIP had the largest one day sell-off (-0.81%) since 12/4/09. It was nearly double normal average volume too. Investors wanted out. Investors in IEF (-1.00%), GLD (-1.86%), SLV (-2.57%), and USO (-1.91%) felt even more pain today, although none of those funds were sold-off on high volume. The euro slid to a 10-month low against the greenback after government officials said the European Union may need International Monetary Fund help to bail out Greece, and Fitch Ratings cut Portugal’s credit rating. Copper prices are down this year, heading for the first quarterly decline since 2008 as the dollar climbed. (Reuters) - Oil fell more than $1 a barrel on Wednesday, weighed down by a larger-than-expected rise in crude stocks and a stronger U.S. dollar. NEW YORK (AP) -- Major stock indexes fell from their 2010 highs Wednesday as weakness in the housing market and rising European debt loads revived investors' pessimistic view of the economy. For what it is worth, here is what I said yesterday on Yahoo's TIP message board. The price of oil has been similarly calm over the last few weeks. I don't think that's a coincidence. I doubt this is a permanent condition. It feels a bit like the eye of the hurricane to me. I suspect down might be coming next, but that's just a hunch. In theory, cash can outperform TIP over any fixed period. Since I sold TIP in November, cash has done ever so slightly better. The jury is still out on what happens next though. So what does this mean? Since real yields and TIP's price are inversely related, that means real yields just jumped higher. MAB had the following to say a few days ago in the comments of a previous post. I still think the prospect of rising real rates is what keeps Bernanke up at night. Hello higher real rates. Hello Fed Chairman insomnia. When the fines and pre-existing coverage "stop-out" go into effect (now for kids, in a couple of years for the rest) drop all coverage for those affected. I have not had health insurance for roughly 10 months. It has not been by choice. I've been paying all my expenses out of pocket. It has cost me roughly $60 per month on average. I don't have any prescriptions. I have no known long-term health conditions. In hindsight, not having health insurance has saved me money. I've been lucky so far. The government apparently plans to fine me 2% of my annual income should I not want health insurance. I expect to earn roughly $40k to $50k per year in taxable income based on modest inflation expectations. Since I am in inflation protected treasuries, this could be either higher or lower but let's call it that. That means it will cost me $800 to $1,000 per year in fines. That is actually a very good deal for me though. That may be my new catastrophic health plan and it should meet my needs quite nicely. It's actually a lot cheaper than the plan I wanted. It's roughly $75 per month and I will sleep well knowing that if I get a long-term health condition that I cannot be denied coverage at that time. My biggest concern was getting a health condition that had long-term costs associated with it. I'm not that worried about a two day emergency event that lands me in the hospital. That would certainly hurt, but it would not be catastrophic. I am taking a risk here, but that's life. It's a constant balancing act between risks and rewards. So let's compare the plan I wanted vs. the one I'll probably be getting and let's assume at first that nothing else changes. I just did a rate quote on one such plan. A $7,500 deductible plan with up to $2,500 in prescription benefits per year would currently cost me $235 a month at the insurer I have used in the past. It's a pretty lousy plan clearly. Prescription drug costs could hurt me. The high deductible could seriously hurt each year too. The same plan with a $1,000 deductible costs $414 per month. That's $2,148 per year more. However, if I am truly sick then I more than make up for it in the $6,500 per year in deductible savings. So here I will most likely sit. I'll have neither plan. I'll be fined each year, but it will only cost me $75 per month. If a long-term catastrophic event occurs (my biggest fear), then I will instantly buy the best coverage I possibly can. They cannot deny me for pre-existing conditions. They must take me. Although I might have serious upfront costs by being uninsured, my lowered long-term costs will more than make up for it. I'm being given a free lunch by doing it this way. Or am I? How long will it take before health insurance companies see what I'm doing and raise rates to compensate? I fully expect 20-50% premium increases immediately, and for the next three years sequentially, in all existing policies. This is precisely what the banks did in front of the CARD act becoming effective, and it will happen here as well. That is the cause of the short-term rocket shot in the health-related stocks this morning. Let's say that is at least partially true. I tend to believe it is. I have shown that the new system appears to be a win for me. I'm relatively healthy. I can also afford the fines. I will sleep well knowing that if I get an expensive long-term health condition, then I will not be denied health insurance. This, by the way, will bankrupt the insurance companies in the end. Nobody will buy until they have HIV, Cancer or some other serious illness - then they will buy, and the companies will have to pay - with no lifetime caps or exclusions for pre-existing conditions. I am not quite as dire as he is. Most people will still buy insurance. However, he does clearly have a point. As my final thoughts, please consider this. Last year I really wanted catastrophic health insurance. I was willing to pay relatively high premiums to get it, if only to sleep better. This year, thanks to the new health care reform that's designed to see people like me actually have health insurance, I no longer seem to want any health insurance at all. Isn't that just a hoot? Way to go Congress! Unintended consequences for the win! Mish had a very amusing Freudian slip today. Can you spot it? This is a victory for common sense over secrecy. The Fed does not want an audit nor will it honor reasonable requests for information. The irony is Bernanke promised more transparency. Bernanke's actions prove what a lair he is. Expect more delays as the Fed will fight this. 2. a secluded or hidden place, esp. a secret retreat or base of operations; a hideout or hideaway: a pirate's lair. A "secret retreat" is clearly the perfect location for "secrecy". Ben Bernanke, you ARE a pirate! March 20 (Bloomberg) -- India’s central bank will probably raise interest rates again next month as the first increase in two years is only the initial step in the battle against inflation, BNP Paribas SA and Standard Chartered Plc said. I have argued in the past that China would have to raise rates before we did, since inflation tends to hit food first and poor countries cannot afford to let that go unchecked. India is even poorer. Inflation is politically sensitive in a country such as India, where the World Bank estimates three-quarters of the nation’s 1.2 billion people live on less than $2 a day. The beatings will continue until the morale improves? (Reuters) - Gold fell toward $1,100 an ounce on Friday, losing nearly 2 percent after an interest rate hike in top gold consumer India, and investors cashed in gains from earlier this week ahead of the weekend. Lawmakers' primary effort to date -- a $17.6 billion tax credit and infrastructure initiative that the president signed into law Thursday -- is quite small, said Kurt Karl, chief U.S. economist with Swiss Re. The primary effort started on Thursday apparently. Yes, I know it has only been a day so far. Yes, I know it only represents about $1,180 per unemployed American. 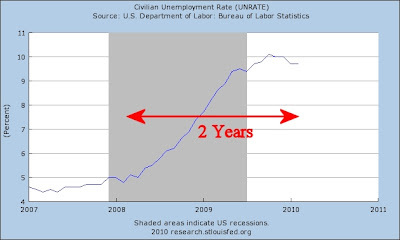 Let's look at the unemployment chart anyway. Maybe there's something we can see lurking within it. Wow. It's been 2 years. Where has all the time gone? When asked for a single word that best describes their impression of Congress, “dysfunctional,” “corrupt,” “self-serving” and “inept” are volunteered most frequently. Of people offering a one-word description, 86% have something negative to say, while only 4% say something positive. “People making comments about bubbles possibly don’t have all the facts,” HSBC Holdings Plc Chief Executive Officer Michael Geoghegan said in Shanghai today. Regulators are in control of the banking industry, and have the ability to curb lending as needed, he said. How powerful are the Chinese regulators you might ask? March 18 (Bloomberg) -- China’s property prices won’t plunge this year, two of Hong Kong’s biggest developers with operations on the mainland said yesterday, as the World Bank joined economists and hedge fund managers warning of a bubble. “China’s home prices won’t drop too much, as the government can’t allow prices to plunge because the real estate market is an important pillar of the economy,” said Henry Cheng, managing director of New World Development Co. and son of its billionaire founder Cheng Yu-tung. Two land sales in Beijing have shattered price records and both buyers were state-owned companies, which has brought outrage and astonishment at the city’s frothy property market. Copper: Is it all just a bubble or is there substance behind it? Chinese demand for copper, real estate, or other assets depends at the margin on the availability of credit. The increases in credit are being reduced by well-publicised state policy. Copper has become a way to bet against that policy. Bad idea. There is a price decline coming soon, whether or not there is a long-term bull market. Some people will make sure they sell before that happens. They care about profits, not documenting why everyone else was making the same mistake. About a decade ago, the Chinese government chose a policy of growth at any cost. China’s leaders see strong gross domestic product (GDP) growth not just as bragging rights, but as essential for political survival and national stability. To maintain high employment, China has poured money into infrastructure and real estate projects. This explains why, in 2009, new floor space doubled and residential real estate prices surged 25 percent. This also explains why the Chinese keep building new skyscrapers even though existing ones are still vacant. I absolutely believe that. I've stated for years that I thought China was recreating our Great Depression. It will tank the commodity markets. Demand for industrial goods will fall off the cliff. I believe that it is likely. I don't know when it will happen though. It could be years away even if I am right to believe it. Finally, Chinese appetite for our fine currency will diminish, driving the dollar lower against the renminbi and boosting our interest rates higher. No more 5 percent mortgages and 6 percent car loans. I do not believe that. Although Chinese appetite for our currency would diminish, I think there would be an enormous flight to US dollars if commodity markets tank and the Chinese miracle story becomes unhinged. Put another way, the US dollar is an anti-commodity currency. The pain would be felt most in the commodity currencies, such as the Canadian dollar. Compare and contrast the action in the Canadian dollar and the US dollar the last time commodity markets tanked (late 2008). That's the kind of flight to quality I'm talking about. I'm not arguing that the US will make out like bandits if and when China stumbles (cheaper oil would help us). Most of our problems will still exist. Our problems may be fully priced in though. China's problems are not. Although their stock market is 50% off its all time high, it is still a miracle story in the eyes of many. I bought Caterpillar (CAT) on August 10, 2000. Nobody else seemed to want it. I sold it on July 8, 2004 for more than twice the price. Everyone seems to want it now though. It currently trades with a P/E of 41. I'll pass. A stagnant economy means there are fewer reasons to celebrate this summer for some communities, or at least fewer resources to do it. Faced with budget woes and potential business sponsors who may have more pressing concerns than getting their name slapped on a community event, the slice of Americana that is summer food-tasting events and July 4 fireworks extravaganzas is set to get thinner for many jurisdictions. That's where the Festivus pole comes in. Unadorned and lusterless. These are typically not adjectives used to market festive holiday decorations. However, this 6-foot aluminum Festivus pole is not your everyday holiday decoration. The Wagner Companies of Milwaukee produced this pole and gave it to Wisconsin Governor Jim Doyle in 2005. The governor displayed it in the family room of the Executive Residence in Madison, Wisconsin during that holiday season. "Festivus" is a holiday popularized by the television show Seinfeld, with the pole, which must be unadorned and lusterless, being the primary decoration associated with the event. I joke that this last bubble was a rational bubble because nobody could see it coming. It was some sort of stealth bubble apparently. In fact, the chart above still can't see it. The following chart can see it though. Big time. They say never try to catch a falling knife. In my opinion, investors of today are trying to catch a knife thrown at a ceiling. Good luck figuring out how high that might be. I'll pass. I offer three charts using data from the recently released Flow of Funds Accounts of the United States. 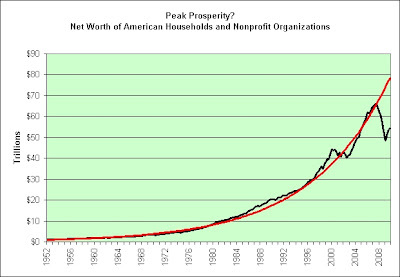 The chart above shows our collective net worth over the years. It is not seasonally adjusted. I have included an exponential growth trend line. It peaked in June of 2007 and two months later I started this blog. 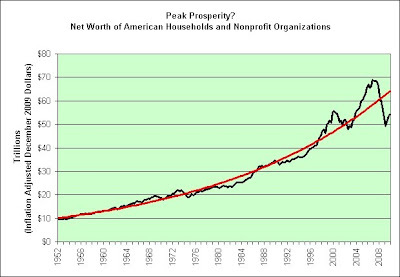 The chart above attempts to remove the inflationary effects to better show the change in real prosperity. 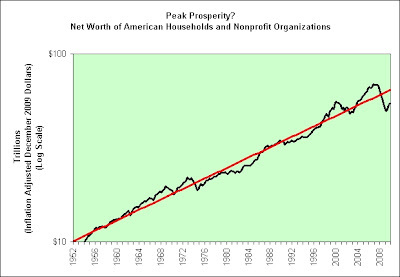 In inflation adjusted terms, net worth peaked in December of 2006. Whether or not it is the absolute peak is anyone's guess. You can pretty much guess what I suspect. Total net worth has gone nowhere in the last decade. It's even worse than it looks though. It's the same amount of total net worth split amongst a larger population. In January of 2000 there were 281 million people in America. Now there are 309 million. We have 10% more people but roughly the same overall net worth. Therefore, the average American is 10% poorer than they were 10 years ago. The chart above has been put on a log scale. 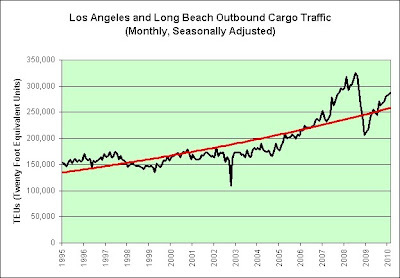 Constant exponential growth, such as the red trend line, is therefore seen as a straight line. Optimists would say that we are still on that line. This is just a short-term setback. I am extremely skeptical. We've never been so far below the line. I just do not see how we can get back to it. There are enormous challenges and headwinds in our future. We're borrowing massive amounts of money to keep the party going. Meanwhile, my state is attempting to raise taxes yet again. The Senate has proposed $890 million in new taxes, including a tax on bottled water, a three-tenths of a cent increase in the state-sales tax, a boost to tobacco taxes, and an end to certain tax exemptions. The House has proposed $680 million in new taxes, but its package does not include a sales-tax increase. This is not an environment where prosperity can flourish. That's my opinion and I'm sticking to it. Credit card users: Not so responsible after all? NEW YORK — With unemployment high and personal wealth diminished, how was it that strapped consumers were paying down their credit card debt last year? It turns out they probably weren't. The bulk of 2009's drop in credit card debt instead came because banks were forced to write off loans consumers failed to pay, according to an analysis of Federal Reserve data. It’s Wednesday, and the week’s U.S. oil inventories numbers will soon be out. I have no clue what they will say, nor much interest, either. But others do. Exactly why oil traders and speculators think the data has anything to do with the state of world oil demand is beyond me. I suppose, like Pavlov’s dog, they’re only doing what they’re trained to do. But their training comes from a world that no longer exists. Inventory levels no longer matter. It is different this time. Between explosive growth in oil-thirsty economies like China and India, and OPEC’s voracious appetite for its own fuel, OECD fuel markets are becoming increasingly marginal. He is yet another believer in the Chinese economic miracle story. In a world where affordable oil supply will soon peak, if it hasn’t already done so, global oil consumption quickly becomes a zero-sum game. How will China and India continue to "grow explosively" if "affordable oil supply will soon peak"? Perhaps inventories didn't matter in 2008 either. Let's look to see what he said then. Mr. Rubin recently predicted oil would gravitate towards US$200 a barrel, driving by soaring consumption in China and the Middle East and constrained supplies. In hindsight, oil gravitated to $145 a barrel. 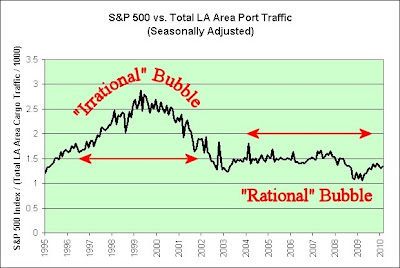 Soaring transportation costs actually ignited deflation though and oil crashed back down to $30+. The report argues a mild U.S. recession will be no cure-all for rising inflation which it sees staying around 4% next year and forcing the U.S. Federal Reserve to raise interest rates into a recovery. In hindsight, we got a severe recession. The non-seasonally adjusted CPI-U rose a grand total of 0.025% from May 2008 to January 2010 (from 216.632 to 216.687). The Fed Fund Rate was 2% in May 2008. It now sits at 0.25%. Economist Jeff Rubin predicts the $7 mark will arrive by the year 2010. Is it 2010 yet? Am I free to use hindsight on this prediction too? I stumbled upon this story last night and it amused me to no end, but from a purely geeky standpoint. Tom Adams: Department of “Huh?” – BlackRock’s Larry Fink as Hero? It pointed me to a Vanity Fair article and a quote within. But while its size was impressive, what would distinguish BlackRock was its state- of-the-art system for evaluating and managing risk. With 5,000 computers running 24 hours a day, overseen by a team of engineers, mathematicians, analysts, and programmers, BlackRock’s “computer farm” could monitor millions of daily trades and scrutinize every single security in its clients’ investment portfolios to see how they would be affected by even the most minor changes in the economy. Churning through 200 million calculations each week, its computers could simulate every imaginable shift in interest rates, every conceivable change in the financial markets, and stress-test the performance of hundreds of thousands of securities in numerous global-crisis scenarios. Here are the facts we are told. 5,000 computers running 24 hours a day! 200 million calculations per week! It sounds extremely impressive, but let's do the math. That's 4 calculations per computer per minute. I think Blackrock needs to upgrade their computers to something a bit faster. Might I suggest something from the period 2700–2300 BC. Let me try to do this justice. I'm running with a screen resolution of 1280 x 1024. There's 1.3 million individual pixels of color on my screen. In order change the screen's image, every single one of those pixel's colors must be set individually. If it took just one calculation per pixel then it would take one of Blackrock's computers 227 days to update my screen. Raw computing horsepower, baby. That's what I'm talking about, lol. Clearly Blackrock's computers are faster than that. I'm heckling the idea that 200 million calculations per week is an even remotely useful statistic to us though. It's like saying that the knob goes to 4. Nothing more. Though a single 3.2 GHz cell processor can deliver over 200 GFLOPS, whereas the Sony PS3 configuration delivers approximately 150 GFLOPS, the approximately tenfold cost difference per GFLOP makes the Sony PS3 the only viable technology for HPC applications. What's 150 GFLOPS you might ask? It's 150 billion floating point operations per second. That's what my single Playstation 3 sitting in my family room can do. My PS3 can do roughly 750 times more calculations than 5,000 BlackRock computers working in concert, or so I am told. It doesn't take a week either. It only takes one second. Hahaha! Vanity Fair's 200 million calculations per week claim is the funniest statistic I have seen in a long, long time. Here's a look at the seasonally adjusted apparel index on a log chart. Constant exponential growth shows up as a straight line. My eye sees 5 trends. I suspect we won't like the 6th long-term trend, but who really knows? I hoarded quite a bit of apparel in recent years. I'm not all that fashionable. I'm all about comfort. I have a ton of clothes in reserve now. Most say "Made in India" on them. 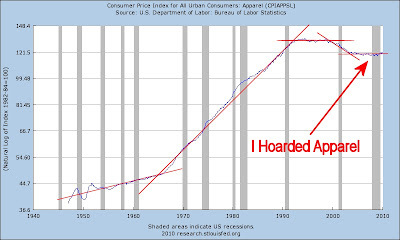 You can see the deflation in the chart as apparel was one of the first things to be outsourced. In order to get further deflation, one would think that we'd need to outsource the outsourcing. Who is going to make t-shirts cheaper than India though? What if the global economy turns protectionist someday? Would I still be able to buy a high quality large tall t-shirt for just $10? I did not want to risk it. We take $10 t-shirts for granted in this country. I can say this. It would take me a lot more than $10 to make one myself, especially if one factored in typical American labor costs. I also have a lot of socks in reserve. I bought my favorite Gold Toe brand at Wal-Mart. It saved me a lot of money doing that. My local Wal-Mart no longer sells them. They switched to a cheaper brand. I do not regret the decision to hoard them. Here's the socks sold at Macy's. They want $21 for 6 pairs. That's roughly twice as much as I paid. I love this sock. No other brand is acceptable to me. I'd pay the $21 today if forced. Fortunately, I don't have to. I may not need to buy socks again for 30 years. That's how many I have, lol. That said, the tennis shoes I hoarded at Costco have not gone up even so much as a penny. Some of my hoard is performing well. Some is not performing so well. To be perfectly honest, I hope that my hoard was a complete waste of time long-term. I do not root for higher prices. Here's a look at the seasonally adjusted energy index on a log chart. Constant exponential growth shows up as a straight line. My eye sees 4 trends, but this last trend's data is extremely volatile. The pain, on the other hand, is unmistakable. We are in the pain cycle and there's no telling when it will end. Some of us believe that stimulus is somewhat of a free lunch concept. We bring future demand into the present and we take on debt to do it. Over the long haul, how does that actually help us? I'm not saying that it is necessarily the worst thing to do, and for temporary shocks it would seem like a really good idea. For structural problems it can't really do much though, and that's what I think we have. 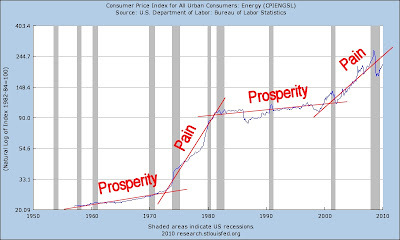 There is also absolutely no denying what stimulus has done to energy prices. In any event, I am not a believer in commodity and/or debt driven stock markets. It's why I call myself Stagflationary Mark and run an Illusion of Prosperity blog. On March 6, 2009 the S&P 500 closed at 666.79. That was the bottom. It closed today at 1,138.50. That's a 71% gain. On December 23, 2008 WTI crude traded at $30.28. That was the bottom. It traded today at $81.87. That's a 170% gain. Ouch. We are clearly still in a commodity and/or debt driven stock market. I therefore continue to embrace the illusion of prosperity, just like I did when I first turned bearish back in 2004. There is some hope though. I do not think it is guaranteed that the "pain" cycle will last forever. There's even some hope that this pain cycle is getting a bit long in the tooth. It's already been 10 years. Maybe we're halfway done. Who knows? I do indeed have a story. A non-programmer once told me how much fun it must have been to work on Magic: The Gathering video games. I never worked on them, but I could certainly imagine working on them. Almost every single card in that card game is an exception to the rule. There are few standards. That makes nearly every aspect of creating a computer game based on it to be a complete and utter nightmare, from programming it to storing the data. It could still be fun to some degree, but only if management truly understood just how much time and money it would take to implement. I would not hold my breath on that one! Several video games based on the Magic: The Gathering franchise exist for multiple systems. Some have attempted to translate the card game to electronic play nearly exactly; others have taken more liberties and drawn more from the setting than the actual rules of the card game. Benefits of successful video game versions of the card game include convenience, practice, and challenge. However, artificial intelligence for a game such as Magic is an extremely hard problem, and such software usually must be continuously updated to stay current with recently released card sets. Here's just a tiny glimpse of the complexity. Here's just a tiny glimpse of what our new electronic health care system could look like. Got a question about a card you've never seen before? Having trouble understanding how a new mechanic works? These pages of Magic Frequently Asked Questions (FAQs) will help answer questions regarding new mechanics, rules, and card concepts introduced in each Magic expansion. To look up a particular card, match the expansion symbol on the card to the symbol below, and click that set's FAQ link. Most of these FAQs have two sections. The first section, "General Notes," explains the new mechanics and concepts in the set. The second section, "Card-Specific Notes," contains answers to the most important questions players ask about individual cards. Items in the "Card-Specific Notes" section include full rules text for your reference. Pick any one of the many, many links located within. Read the contents. Gasp in horror. Here is a sample chosen at random for comedic effect. -- If two Zendikons are enchanting the same land, the one that became attached to that land last determines the land's color, power, and toughness. The land has all creature types and all abilities granted to it by either Zendikon. -- If a land such as Celestial Colonnade is enchanted by a Zendikon, then that land's animation ability is activated, the activated ability determines the land's color, power, and toughness. The land has all creature types and all abilities granted to it by the Zendikon and by the activated ability. Without standards, welcome to the world of the Celestial Colonnades! And Citigroup? The bank that was hardest hit by the financial meltdown has seen its shares triple to $3.50. Citigroup's meltdown could easily triple double to $7.00. Strong. Resilient. Caloric. There's just no keeping this economy down! Here are some other numbers that tell the market recovery story. They seem to be conveniently missing from the article though. Go figure. March 8 (Bloomberg) -- Crude oil rose for a second day on speculation improving world demand and OPEC supply restrictions will help slow growth in stockpiles. If we can get oil to $80 with actual ongoing job losses, then just imagine what the price of oil will be once the economy fully recovers. This shows the ratio of crude oil (Cushing, OK WTI Spot Price FOB) to natural gas (U.S. Natural Gas Wellhead Price) over the years. I have also added recession bands. Look at that long-term trend. It's as flat as the earth was once thought to be. For whatever reason, it seems to like 10. 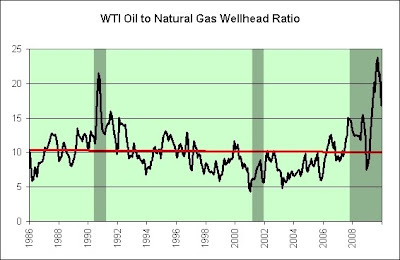 Question: Will the crude oil to natural gas price ratio return to historical levels? Conclusion: No, although at times the historical ratio will seem to apply, if only by coincidence. It will never return to the historical level again. You heard it here first folks. Even if it miraculously drops down to 8 and hangs out there for a bit someday wildly contradicting the claim, then rest assured that it would just be a coincidence. She uses data that goes all the way back to mid-2006 to make her point. Oh the things that can be done with 3 1/2 years of historical data. I could probably predict the next ice age if I set my mind to it. It's based on energy equivalent. So, basically, if you burn a barrel of oil, you get about 6 million BTUs of energy out of it. If you burn one Mcf of gas, you get about a million BTUs out of it. So the assumption has been that 6 Mcf of gas is, therefore, equivalent to one barrel of oil, which makes sense on an energy equivalent basis. In the ultra long-term, I'm thinking the ratio has fundamental reasons to come back down to 10. I guess you could say that I just don't think it is different this time. I'm no expert though. If only I could remember what this ratio did during the last housing bust in the early 1990s to see if spikes like this were even remotely normal. Sadly, that would require my eyes to drift back up to the chart again. I'm just too lazy. Sorry. Do let me know if you spot anything that looks like a massive spike though. Rumor has it that oil hit $36 a barrel in October 1990. In hindsight, I'm told it was an awful time to back up the truck (pun intended). First, let me put that recent climb in perspective. From 2001 to 2009 these postage rates have gone up at an average annual pace of just 3.3%. That's it. I'd say that is pretty good considering that delivering mail requires fuel. We know what fuel has done over the period. 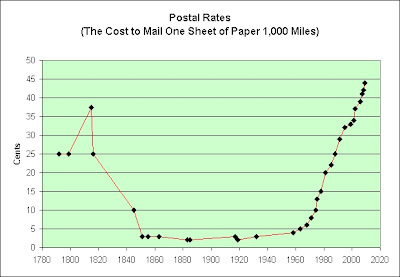 Second, it is almost as cheap to deliver mail now as it was in the early 1800s. I'm not even factoring in inflation over the last 200 years to make my point. Just imagine what it would look like if I did that. The words "productivity miracle" come to mind. So why are we complaining? Third, look what I am doing right now. You are reading what I am writing and other than a monthly fee to connect to the Internet, it is 100% free. How is the Postal Service expected to compete with that? Here's some bonus free words. Free, free, free, free! It's the ultimate deflationary concept. Fourth, I can put a letter in my mailbox. A man will come to my house and pick up that letter. Many men will transfer that letter 1,000 miles away. A man at the other end will deliver that letter to a mail box of my choosing. This costs me a grand total of 44 cents. It's a frickin' miracle. That's what I think. According to the IRS, I couldn't even drive one mile round trip to deliver it myself, and that's assuming I'd want to work for free. Fifth, I've lived in my house for 13 years. I can count the number of missing recurring bills on one finger. That's a frickin' miracle too. All things considered, I'm happy with our Postal System. I'm happy with my mailman. Let's cut them all some slack. Oh yes, there is another alternative: kill the Postal Service and leave it to the private sector to fill the gap. Yes, by all means kill the Postal Service. The private sector will do a much better job. Perhaps Comcast could do it. In the past 10 years they have visited my house many, many times to fix problems. Let's start with them. They are often here anyway! No, wait. I've got a better plan. Let's let the private banking system deliver my mail. Nothing ever gets lost there, other than perhaps a trillion dollars every now and then. No big deal. Disclosure: I own many forever stamps due to a lack of investment alternatives. They are for long-term personal use. I do not intend to resell them. I therefore will not be paying taxes on any inflationary gains that might accumulate. Repeated good outcomes provide us with confirming evidence that our strategy is good and everything is fine. This illusion lulls us into an unwarranted sense of confidence and sets us up for a surprise (usually negative). This is a big risk. See The "Sure" Thing. In most day-to-day decisions, cause and effect are pretty clear. If you do X, then Y will happen. But in decisions that involve systems with many interacting parts, causal links are frequently unclear. For example, what will happen with climate change? Where will terrorists strike next? When will a new technology emerge? Remember what Warren Buffett said: “Virtually all surprises are unpleasant.” So considering the worst-case scenarios is vital and generally overlooked in prosperous times. In my opinion, what a great article! This post inspired by GYSC. Here's a look at the seasonally adjusted food index on a log chart. Once again, this means constant exponential growth will show up as a straight line. I'm seeing three lines. We are firmly on line #3. I am posting this because my local QFC is allowing me to buy 12 cans of Progresso soup on sale for 99 cents per can this week. My hoarded soup supplies are turning into something of a joke. I am not complaining though. I'll happily laugh at myself while buying more reasonably priced food. I remain stagflationary long-term, but the data is leaning much more towards the stagnant growth part of the story and not so much the inflation part of the story. As a saver, I'm fine with that. Each year I brace for the inflationary financial pain to hit my conservative treasury inflation protected securities (TIPS). It never seems to come. I'm fine with that too. Rising worldwide food inflation is surprising and puzzling economists. They don’t understand why it is happening (they didn’t see the credit crisis or the bursting commodity bubble coming either). Next month, as food inflation continues to grow worse and consumers around the world start stockpiling food, these economists will really start to worry, and, in about two months time, with food inflation truly spiraling out of control, they start panicking, their deflation predictions completely forgotten. It is one year later. So where is the inflationary death spiral? I was at Costco the other day. The dry spaghetti I like is now cheaper than it was when I first began to hoard it a few years ago. They even had someone offering free samples with the Prego sauce I also like. 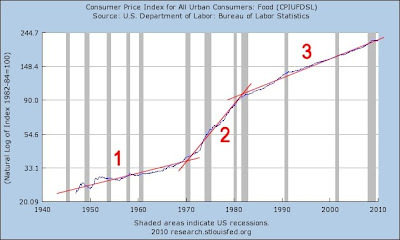 In my opinion, food prices in general are not "spiraling out of control" in America. I cannot say what the future will bring, but there's a decent chance that we're getting more hysteria than actual inflation, at least so far. The Baltic Dry Index "will be less responsive to shifts in demand as the oversupply of vessels becomes more pronounced," said Plamen Natzkoff, dry bulk and freight strategist at Citigroup in London. While the index "will still reflect the supply-demand balance in the freight market," its worthiness as a wider-ranging indicator will be limited, he said. The index for sanity checking global overcapacity is now itself suffering from global overcapacity. Perhaps we need a Baltic Dry Index Buster Buster. There was a banking panic, starting August 9, 2007. I jumped on this like a rabid weasel. 22 days later I launched this blog. I probably could have acted quicker, but once the initial euphoria about describing the end times as we know it abated, apathy and procrastination once again became the norm. That's just my nature. Sorry. The panic in 2007 was not observed by anyone other than those trading or otherwise involved in the capital markets because the repo market does not involve regular people, but firms and institutional investors. Fortunately, I am not a regular person. What regular person would want to be called Stagflationary Mark? It's like something out of a comic book. Only a true nutcase would do that! Outstanding subprime securitization was not large enough by itself to have caused the losses that were experienced. Further, the timing is wrong. Subprime mortgages started to deteriorate in January 2007, eight months before the panic in August. I know! It's so silly. I mean, sure, there were cracks in the dam. Water was starting to leak out but there really wasn't that much. So why would the dam fail so much later? There weren't even sirens until the last possible minute. 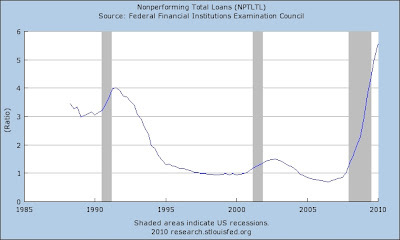 Holding loans on the balance sheets of banks is not profitable. This is a fundamental point. This is why the parallel or shadow banking system developed. If an industry is not profitable, the owners exit the industry by not investing; they invest elsewhere. I always wondered how my checking account could be free. I just thought I was one of the lucky ones though. How big was the repo market? No one knows. The Federal Reserve only measures repo done by the 19 primary dealer banks that it is willing to trade with. So, the overall size of the market is not known. I roughly guess that it is at least $12 trillion, the size of the total assets in the regulated banking sector. The fact is, however, that the repo market was never properly measured, so we will likely never know for sure how big it was. I like it. I like it a lot. It adds an air of mystery van. The crisis was not a one‐time, unique, event. The problem is structural. The explanation for the crisis lies in the structure of private transaction securities that are created by banks. This structure, while very important for the economy, is subject to periodic panics if there are shocks that cause concerns about counterparty default. That's great news. I think there's a bull market in counterparty default concerns! I'd hate to think that my blog would become obsolete. Mish has some charts up today that look pretty bad. I'm taking a closer look at one of them in particular. 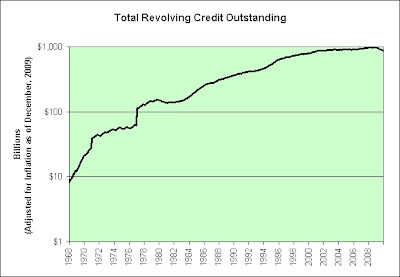 He put up a short-term chart of revolving credit. 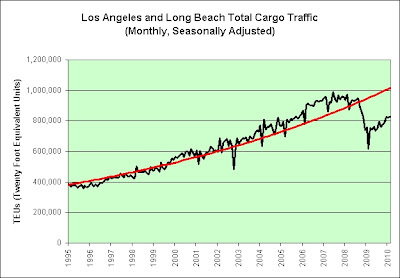 Here's the long-term data plotted on a log chart. 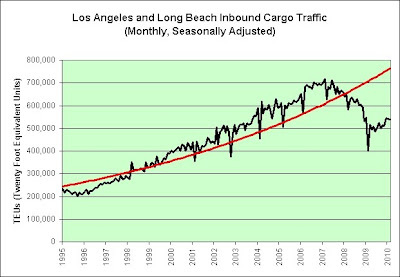 Constant exponential growth on a log chart looks like a straight line. The line in the chart above is not straight though. It is curving downwards and has been doing so fairly consistently for 40 years. That means that the exponential growth rate in revolving credit is clearly slowing and has been slowing for a long, long time. We may actually be seeing the first signs of peak revolving credit. Now imagine how much worse it would look if I adjusted it for inflation over the years. Hey, guess what? You don't have to imagine it. 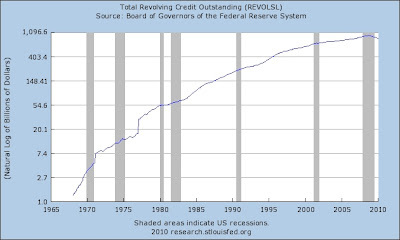 In inflation adjusted dollars, total revolving credit is currently no higher than it was in early 2001. For those keeping track at home, that was two recessions ago. Credit is the lifeblood of market economies, and the damage to our economy resulting from the constraints on the flow of credit has already been extensive. When you came in the air went out.